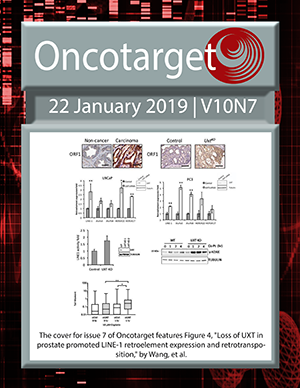 The cover for issue 7 of Oncotarget features Figure 4E, "UXT-KO in prostate cancer cells increased DNA damage accumulation and sensitized cells to cisplatin," by Wang, et al. Pro-tumorigenic non-pump function of sodium iodide symporter: A reimagined Trojan horse? PARP6 inhibition as a strategy to exploit centrosome clustering in cancer cells? 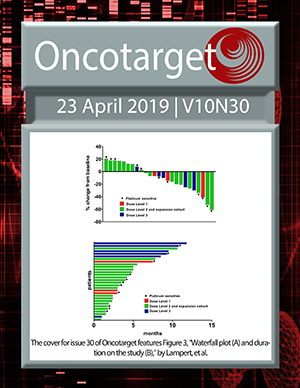 Can we predict long-term survival in resectable pancreatic ductal adenocarcinoma?